AndrewGilmore.net: Are We Alienating People from Christ? One of the things they don't tell you when you're a teenager trolling the shelves at Barnes and Noble, envisioning your name on one of the covers, is the amount of marketing you have to do when you're an author. They really should train the staff to spy out aspiring book geeks like myself. Once spotted, the be-smocked bookseller could politely tap him or her on the shoulder and say, "You realize writing the books is just the beginning, right?" Then those whose bubbles are tough enough not to burst from the reality check could double down on their dreams, gird their loins, and pick up a marketing book while they're there. As an author trying to create a career from my writing, my favorite source for practical marketing advice is the podcast interview. They are free sources of information from people in the trenches of online advertising and content marketing. (Want to know which Christian podcasts I listen to? Click here). Several months ago, while listening to one such interview with a well-respected marketer, the interviewee made an offhand statement, tangential to the conversation. The aside served as a metaphor to illustrate popular ignorance. He said, essentially, that evolution is a scientific fact, yet millions of people reject it. The implication was clear: these people are idiots, and no amount of logic will cut through that. But that wasn’t the worst part. I felt betrayed. Here was a man I had a tremendous respect for, making an exclusive claim to truth and calling all who did not believe ignorant and idiotic. But even worse than my initial reaction, offense, I realized his metaphor had alienated me from him. I can no longer read or listen to anything the man says without a great deal of mistrust. Now, this marketer is very strategic in almost everything he does, so it’s totally possible he was intentionally alienating a segment of his listeners in order to strengthen the bond with his core audience. That’s fine. That’s his right. But the purpose of this article is not to bash said marketer. Instead, after my rage slowly wore off, I began to wonder if I ever do the same thing. I claim to have the truth. Do I beat other people with it? Christianity has a reputation for arrogance and dismissiveness. Is the reputation deserved? Jesus said, “I am the way, and the truth, and the life. No one comes to the Father except through me.” (John 14:6). That’s a claim to exclusivity. But let’s not fool ourselves. All truth claims are claims to exclusivity. Apologist and Philosopher Dr. Ravi Zacharias says all religions and all worldviews are, at their core, exclusive. “Even all-inclusive religions such as Bahaism end up being exclusivistic by excluding the exclusivists!" So you see the issue is not whether or not we claim exclusive possession of truth, but our delivery in doing so. Where unnamed marketer insulted my intelligence, we Christians should look inward and ask, are we doing the same? In claiming Christ, are we calling those who reject him idiots? If not by words, then by social media posts, or by our actions or posture towards the unbeliever? 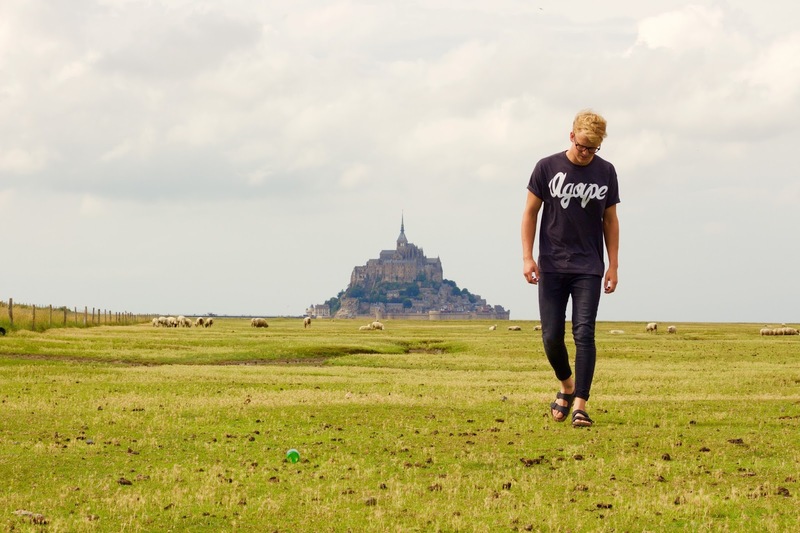 The Bible says we should approach the unbeliever in a different way: as lost sheep. As hard as it can be, we should express compassion and empathy toward the man or woman who disbelieves, because he or she is simply lost. I think it is so easy to put on an elitist mindset, because we know the truth and all these other fools running around the globe don’t. But whether intentional or not, I believe such a posture is a sin or at best ineffective. God values humility, not arrogance. That was Jesus’s main beef with the Pharisees. He railed against their pride more than their theology. When confronting them regarding tithing, he didn’t say they shouldn’t tithe. Instead he said this: “You give a tenth of your spices—mint, dill and cumin. But you have neglected the more important matters of the law—justice, mercy and faithfulness. You should have practiced the latter, without neglecting the former” (Matt. 23:23). In other words your head might be in the right place—i.e. you might understand the truth—but your heart can still be far from God. Embracing arrogance only drives away potential converts to Christ. 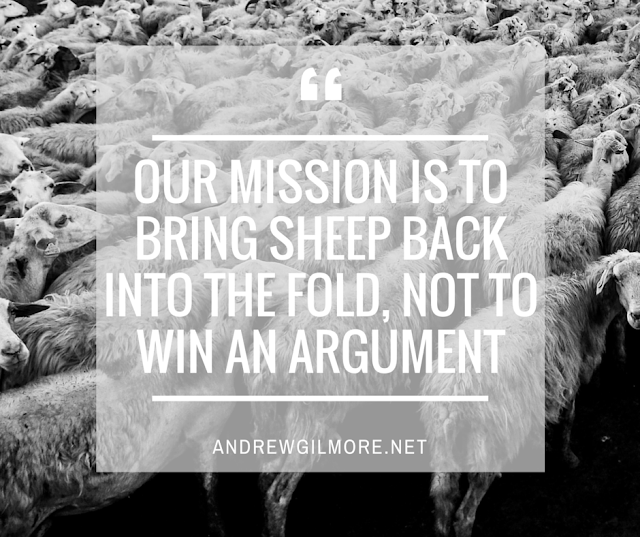 Our mission is to bring sheep back into the fold, not drive them away. God cares for the lost. We should too. Although we possess “the light of the knowledge of God's glory" (2 Cor. 4:6), we should not think ourselves better than those who don’t. Instead we should count ourselves blessed to have had the exposure to the truth, and for the grace of God to forgive our sins. Amen. When Jesus sat on a hill overlooking Jerusalem, he wept. He cried because He was the truth, yet many in Jerusalem rejected Him. He knew how to solve their problems, how to take away their pain, but they would not accept it. They weren’t idiots, they were blind. Though they had eyes they could not see. May we also approach the lost with tears rather than with boasts.